As a Film Studies major you will be immersed in a rigorous study of the art of cinema that emphasizes critical and creative thinking. You’ll watch, analyze, discuss and write about films from the world over and you will graduate with a deep knowledge of the moving image and its cultural, historical and socio-political traditions. 10-12 film courses each semester, including regular new topics courses designed to keep the curriculum lively and fresh. A truly global perspective, not limited to a single course; instead most of our courses will draw upon films from around the world. Our student-centered program means that faculty and students work closely together and you choose your own faculty adviser. Our curriculum is flexible and transfer-friendly and we keep prerequisites to a bare minimum. 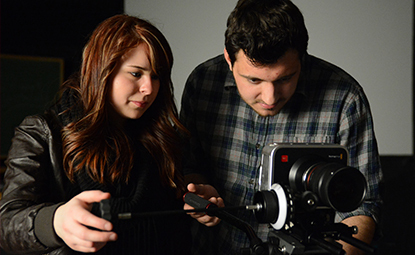 Students majoring in film studies may also minor in film production. Alumni have found success in a wide range of careers from production and post-production to media education, public relations, gaming and film criticism. Alumni have gone on to get M.F.A, M.B.A., PhD. and law degrees, reporting back that our film program prepared them well for graduate studies. The International Film Series, curated by our own Professor Felip Costaglioli, has served as Central Minnesota’s premier foreign cinema showcase since 1996. Two competitive merit scholarships each year: The Ronald G. Perrier Film Scholarship ($1,000-$1,500) and Dale and Gretchen Swanson Film Scholarship ($500-$1,000). Our program undergoes a comprehensive external review every six years. Our most recent team of reviewers found that our students reported “startlingly" high satisfaction with the major.